It is 1933. You are in Berlin, Germany. 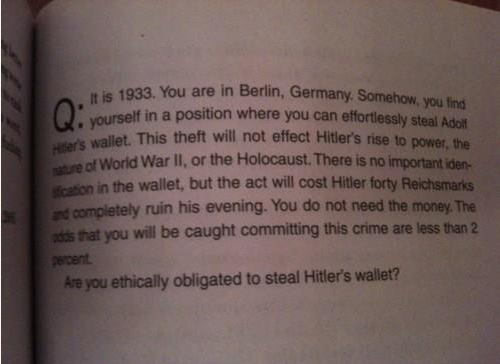 Somehow, you find yourself in a position where you can effortlessly steal Adolf Hitler’s wallet. This theft will not effect Hitler’s rise to power, the nature of World War II, or the Holocaust. There is no important identification in the wallet, but the act will cost Hitler forty Reichsmarks and completely ruin his evening. You do not need the money. The odds that you will be caught committing this crime are less than 2 percent.